Vegan potstickers stuffed with triple mushroom and tofu – all wrapped in healthy whole wheat dumpling wrappers. A very more-ish Asian appetizer! When Cauldron asked me to come up with a Chinese tofu recipe in celebration of Chinese New Year, my thoughts turned to pot stickers – Chinese-style dumplings – with a super tasty vegetarian filling. Something almost meaty. One of the last things I tried to make with whole grain flour was pot stickers. Part of me felt that it would definitely not work well, so wasn’t worth bothering with. Despite having this feeling about whole grain flours embedded in me – that they are inherently inferior to cook with – pretty much every substitution I’ve made has turned out fantastically. Except rye flour Yorkshire pudding. That wasn’t a go-er. So I was both surprised and not surprised to discover that you can indeed make a beautifully thin, delicate pot sticker pastry using whole grain flour – spelt flour at that. Again two trusty kitchen staples come into play with this recipe – a pasta machine and avocado-spelt pastry dough. Look how thin those wrappers are! Rolled through a pasta machine you can get them wonderfully even and with none of the dough spring-back that you can get when using a rolling pin. The only thing to remember is to work quickly so they don’t dry out as you go. I use a nifty gadget when making dumplings or gyoza. It definitely is cheating so if you want to try the traditional way you can follow this pot stickers tutorial, but I still love it because it allows me to whistle through huge numbers of dumplings, all with firmly sealed, evenly trimmed edges. Many quick and enjoyable dumpling appetizers or side dishes ready and waiting in the freezer. Get your dumpling press here. Onto the filling. The trick with making a really beautifully flavoured vegetarian filling is to make sure each element is cooked to perfection before being added to the mix. I think this is very often overlooked in bad vegetarian cooking (and bad regular cooking as well, I suppose). Vegetarian ingredients often do not have the intrinsic flavour and umami that meat has. This flavour often needs to be coaxed out. Think of the difference in flavour between a raw, watery mushroom and one which has been roasted to concentrate flavour and caramelise its natural sugars. I know which one I’d rather have inside my dumpling. So each ingredient is prepared separately, according to its needs. The mushrooms are chopped fine and roasted brown. The Cauldron tofu is crumbled and drizzled with soy sauce before meeting the same fate as the mushrooms. I used four kinds of Chinese chillies, sourced from my favourite dried chilli emporium – Facing Heaven, Long Facing Heaven, Chinese White and Xian Horn chillies. If you’re feeling very daring you could also chuck in a Shabu Shabu (picured second from the left), one of the world’s hottest chillies, but on your own head be it. The prize for ‘unusual ingredient of the post’ goes to Chinese black fungus, or Jelly Ear mushrooms as they are also known. I have been intrigued by them for a while, but have always been a little reluctant to actually buy, prepare and eat them. I think it was something to do with the whole ‘jelly ear’ thing. But for this Chinese recipe, I decided to give them ago. They look quite beautiful dried, with a downy, suede-like texture. Re-hydrated they look a little more scary, but finely chopped they are a very interesting addition to the food – velvety brown and intriguingly crunchy. I’ll be using them again. I also learnt, as I researched how to prepare them, that they are very good for you too. Mushrooms are a strange and mysterious plant-animal hybrid with all kinds of amazing properties that are just being discovered. These ones are said to be excellent for heart health as well as being high in fibre, iron and important anti-oxidants. Lastly, the whole umami party filling is lightened with some fresh, zingy garlic chives complete with their tasty flowers. No one could say that this protein-rich tofu filling is tasteless. Roasted crispy and caramelised, it is chewy, meaty and crunchy all at the same time – flavours and textures that are reflected back in the browned mushrooms and velvety jelly ear mushrooms. 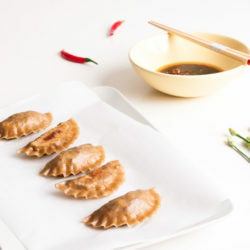 Prepared in this way you can also cram a lot more vegetable into one dumpling, so they are healthier not just because they are made from 100% whole grain spelt flour, but also because the balance of protein, vegetable and carbohydrate is better. For the dipping sauce, I turned to an old faithful – a quick mix of naturally-brewed soy sauce, crushed garlic, sliced red Bird’s eye chillies and roasted sesame oil. It gets hotter and more garlicky the longer it sits, so use that information to decide how far ahead you want to make it. I like mine after about 24 hours when the flavours are most intense, but of course it can be made right before serving too. Healthy, happy Chinese tofu dumpling nom. Whole grain vegetarian pot stickers stuffed with beautifully flavoured tofu and triple mushroom filling and wrapped in healthy, homemade spelt pastry wrappers. Mix all ingredients and set aside - the longer you leave the sauce, the spicier and more garlicky it will get, so plan accordingly. Blend the avocado flesh and salt into the flour so the avocado is thoroughly mixed in - there shouldn't be any lumps of avocado left in the mixture. Add enough very hot water, pulsing as you go, to create a supple, non-sticky dough (I used about 150ml). Turn out of the machine and knead for about 10 minutes, until the dough feels smooth and supple. You could also make the dough in a stand mixer, in which case you would blend the avocado in with the beater, then switch to the dough hook to knead. Wrap in plastic wrap and set aside. Soak the shiitake, jelly ear fungus and dried chillies in enough cold water to cover until fully re-hydrated, about one hour. While the mushrooms and chillies are soaking, preheat the oven to 230c. In the same food processor you made the dough in (no need to clean), chop the mushrooms finely. Spread in an even layer over a rimmed baking sheet and roast until browned and dried out, stirring once, about 20 minutes. When they are nearly ready, remove from the oven and drizzle over a little soy sauce to season. Return to the oven for a few minutes to dry out, then add to a large bowl. Line a rimmed baking sheet with baking paper and crumble the tofu over it in an even layer. Drizzle over soy sauce (to taste) and roast in the oven with the mushrooms until caramelised and crispy, about 25 minutes. Add to the roasted mushrooms. When the shiitake mushrooms are ready, trim off the woody stems and add to the food processor (again, no need to clean) with the soaked chillies, fresh ginger, garlic and sesame oil. Blend to a paste, scraping down as necessary. Mix into the mushroom and tofu. Chop the chives finely, reserve a little for garnish, then mix the rest into the filling. Taste the filling for spice, seasoning and balance and adjust as necessary. Roll out the pastry as explained in this spelt pastry pie recipe, making sure your pastry sheet is wide enough for your cutter (mine was 10cm). Working one sheet at a time so it doesn't dry out, cut out circles with a biscuit cutter. Lay the pastry circle over your dumpling press and add tablespoons of filling to the centre. Moisten one edge with a little water, make sure no filling is obstructing the edges and squeeze the dumpling press firmly together until the dumpling is completely sealed. If you want a very even edge, while the dumpling press is closed, scrape the excess pastry off (pictured) before opening the press. Lay finished dumplings on a baking sheet covered with baking paper and sprinkled with a little cornflour/starch - see below for freezing instructions. 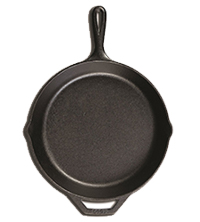 Heat a heavy-bottomed pan over medium heat until hot. Add a thin film of oil and when hot, add the dumplings. They should be in an even layer with a little space between each dumpling to allow for swelling. Cook until lightly browned on one side, then add about 200ml/just less than a cup of water to the pan and quickly cover with a lid. Reduce the heat to low and cook for about 10 minutes, until all or most of the water has been absorbed. If there is still water when you remove the lid, but the dumplings are ready, turn up the heat to boil off the water and recrisp the bottoms. Can be very successfully frozen. Line a baking sheet (that will fit in your freezer) with baking paper and sprinkle with cornflour/starch. Add the dumplings to the baking sheet in a single layer, not touching each other. When frozen, transfer to a freezer bag or tub. Cook as for fresh - they may take a few extra minutes. This post was sponsored by Cauldron, but the recipe and thoughts are all mine. I’m just becoming turned on to the joys of the black fungus, but I’m very impressed so far. Do you have any other cooking recommendations? Thanks for the tips Dini! A stir fry sounds very appealing – did you cut the mushroom into strips for that? I am amazed by this recipe- I mean, using avocado and spelt flour for the dough is brilliant! I love anything with spelt flour but I never would have thought of using avocado in it. Fantastic! And I love the huge flavor and variety you have in the filling! It’s a fantastic dough, you can use it to make all kinds of great food, from wafer thin filo/phyllo to dumpling wrappers to tortillas. Can’t recommend it highly enough! These are gorgeous pot stickers! Hello again Kristie – thank you! How’s Nelson? Mmmmh. These potstickers look perfect!